Please Jesus PLEASE, No Parable Today! On this Mid-Term Election day, please spare us your cute little anecdotes! ...and don't call Jesus "Shirley"! Could Jesus be the Leslie Neilson of Mark’s gospel?? We have lived through the shock and horror of September 11, the gracious coming together of September 12, the “new normal” of September 13…. Where do we go from here? Let’s see what a comic lens on scripture might suggest…. 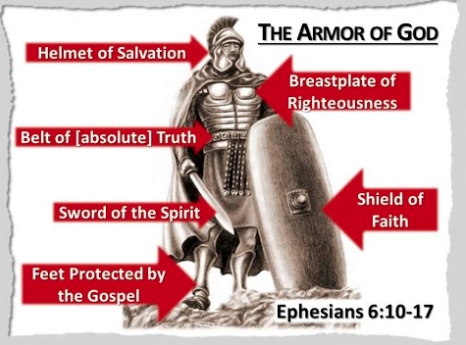 The Whole Armour of God! Let’s face it. Soldiers dressed in garb that looks distinctively “unsoldiery” is funny! 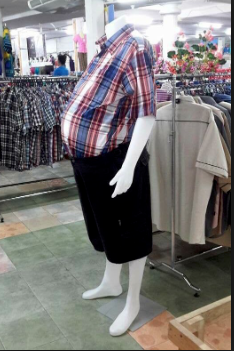 No matter what else you might think, their pants are very slimming, don't you agree? 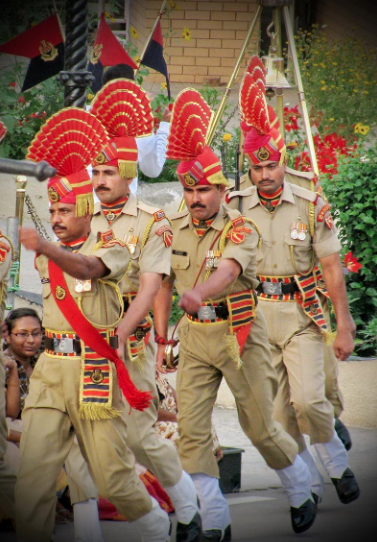 Several terrifying Indian guards. Believe it or not, their nemisis, the Pakistani guards, are equally as terrifying. There are whole web sites devoted to this sort of thing. Of course, after a bit of snickering, those of us with at least some experience in studying history know that there was some good reason these outfits were terrifying in their time. Funny soldier costumes aren’t limited to those actually used in service. They also are found on fictional characters whose authors want to make a statement about their (the character’s and character’s uniform’s) undeniable ineffectiveness for combat. One of the most famous is Don Quixote and his garb. I will say right off the bat I have not read Cervantes comic masterpiece (and the world’s first novel! ), but from articles I have read on the subject he is a delightfully if woefully mentally challenged old man, having read too many chivalrous romances he enters into that world to battle dragons and save damsels in distress. What we see is an old man in even older armor - his great grandfather’s that “had been for ages lying forgotten in a corner eaten with rust and covered with mildew that…he scoured and polished it as best he could.” In it he battling windmills he’s sure are monsters in order to rescue his lady love, Dulcinea, a woman who to Quixote surpasses godessness even though she is but a “sturdy farm girl” who he hardly knows and who never shows up in the story. Don Quixote - and his outfit - say many good things to us, but military victory against the enemy is not one of them. Thrilled to here highlight my brother-in-law, Henry Godinez, who recently appeared in a production of DQ in Chicago. And in this cool costume! The Comic Lens would suggest we add another most-goofy-looking soldier to the discussion. The one described in Ephesians 6. ...such deceptions don't seem to accurately represent what Paul is proclaiming. Nor does it reflect well Jesus' wry observation that God favored - and, hence, we witness as ultimately victorious - the peacemakers in our midst. First we are told to wear the belt of truth. And it’s usually depicted as the foundation of what makes us stand bold and firm. Intimidating in our fitness for battle. Yikes! Several spiritual ab crunches are definitely in order! "Why do you glare at your wife loosening her belt one notch instead of your own gut which blocks your view of your feet?" 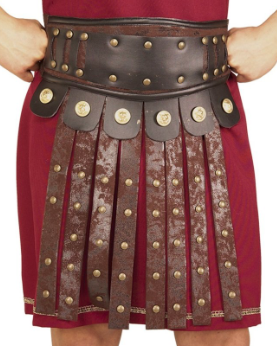 If a belt is really reflecting the way of truth, it should be elastic and/or easy to loosen. For bodies like this one. The real kind! This is the silhouette of many an empassioned church leader, yes? Then there’s the breastplate of righteousness. 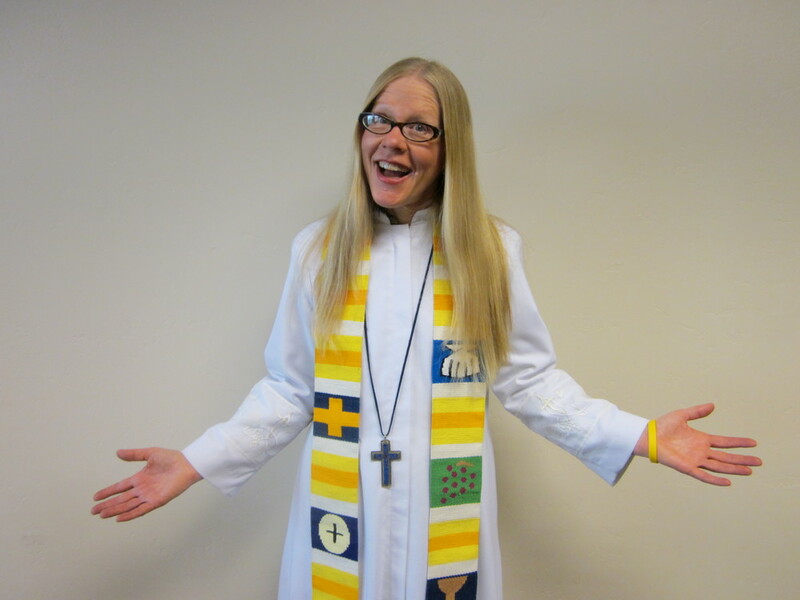 Is a Christian breastplate smooth and shiny and powerfully unassailable? Or might it look pretty beaten-up? And not because of enemy attack but from beating upon it oneself? 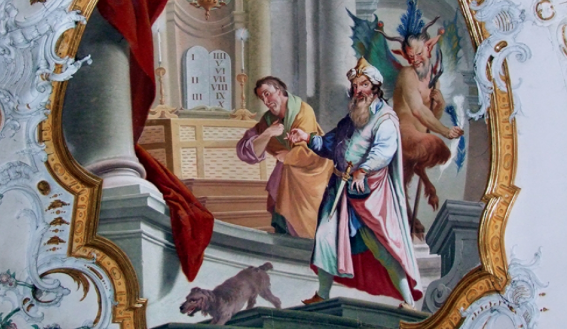 In the Parable of the Pharisee and Tax Collector, it's endlessly penitent one whose breast is protected from the mark of the Evil One. And the shoes that proclaim the gospel of peace - they would be either very worn down, since Jesus told his disciples to go out in two’s, proclaiming the Kingdom of God, and they were to bring/wear but one pair on the journey, or they’d be ridiculously incongruous, for, as we know, the best way to develop compassion, the kind that leads to a just and lasting peace, is to walk a mile in someone else’s shoes. The shield of faith. A large and as beautifully marked as something typically seen on an Errol Flynn sound stage? Or something more the size of a mustard seed? The "size of faith" Jesus says is all we need? And wasn't that the amazing point of David's defeat over Goliath? He didn't need a shield at all! The helmet of salvation. What would that be?? 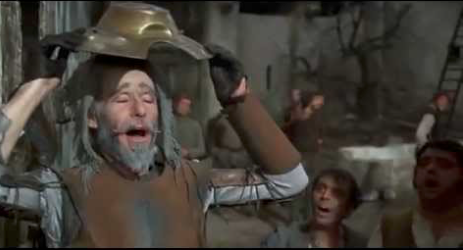 There’s a funny encounter in Chapter XXI of Don Quixote where our hero sees a man on a mule wearing something glittering on his head, which turns out to be a basin that the mule man wears to protect his head from the rain. DQ is quite sure it’s the mythic Mambrino’s helmet and vows to win it and wear it to better enable his heroic pursuits. His helmet choice has enthralled millions throughout the ages! While I don’t find a parallel in the biblical text, it does bring to mind another ridiculous misappropriation, and that’s where Paul reminds the Corinthian Church that Christ followers are the world’s “offscouring” - referring to the disgusting old gunk that sticks to the bottom of a frying pan. While we may think the salvation Christ brings makes us look nobly intimidating, it couldn’t be further from the truth. As the Comic Lens as noted many times, the notion that God would come to earth to die and rise from a cross was so inappropriately shocking only a fool would make such a claim. This is how Jesus is described in the Book of Revelation, coming again with the sword of God's word protruding, and terrifyingly so, from his mouth. Don't try this at home! Children of Isaac, ready to "Charge!" Unfortunately I’m no graphic artist nor do I photoshop (the only technology I really have a good handle on is my Hi-Tech dental floss). So we have to imagine how absolutely ridiculous Paul's rendering of a soldier overcoming the principalities and powers of darkness, the present world rulers as well as the spiritual hosts of wickedness. The best I can do here is mush it all of Paul's mock military imagery, literally, altogether! And it comes in tin! Sure, it's crazy. Maybe even offensive. But isn't it true - and wouldn't both Paul and Jesus remind us that the key to undoing evil is not defeating it as much as dissolving it with humility, awareness, repentance, faith, a flat head (so an old pan will well fit on top!) and, last but never least, plenty of humor. Could this be the real reason for Sargent Carter's intense buzz-cut? To allow his helmet of salvation to fit perfectly?? Oh what liturgical dance (and other fun, outrageous stuff) Jesus’ insistence we drink his blood and gnaw on his flesh inspires for truly lively (or is it unlively?) worship!